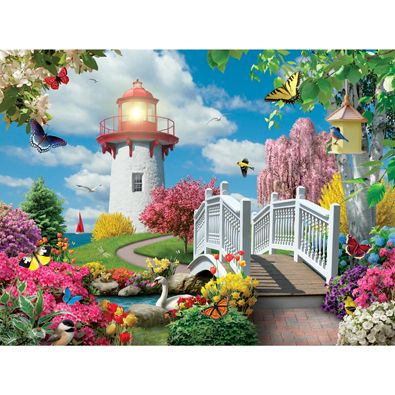 This 1000-piece jigsaw is designed by Alan Giana and measures 51cm x 68cm. Spring is in bloom! A light house shines over a river surrounded by flowers. This 1000-piece jigsaw is designed by Alan Giana and measures 50 cm x 69 cm. Woodland creatures gather around a cabin in a snowy forest. Available in two piece counts. This 1000-piece jigsaw is designed by Alan Giana and measures 51cm x 68cm. The barn is open for business as they prepare for the fall harvest festival! Available in two piece counts.